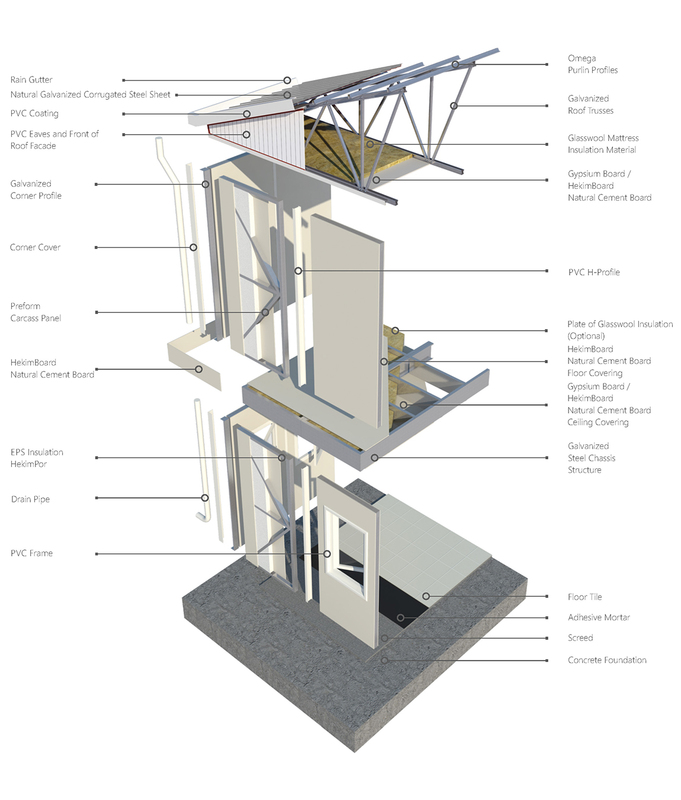 It is construction system, established by combining the structure consisting of the combination of purlin, truss, carcasses, frames, columns and beams; after the carcasses produced by HekimStructureRobotecnology, are coated at the factory and jointed with the apparatus and bulbous (bolted) joints. The surfaces of the wall panels, which are made of galvanized steel profile, are coated in the factory with HekimBoard Natural Cement Plate, which has the class A1 fireproof property. The roof system with galvanized steel profile is covered with natural galvanized trapeze sheet. Glass fiber mattress is used in roof insulation. Outside; silicone Physician Paint is used. Interior space; Plastic Physician Paint is used. Lighting fixtures consist of switches, sockets, cable - ducts, fuse - fuse boxes and leakage current relays. It consists of a wall mounted ceramic sink, an acrylic shower stall, a toilet with plastic reservoir, and a chrome plated 50 x 100 cm kitchen bottom cupboard.